DaCorsa are a group of German enthusiasts who restore and ride retro road bikes part as hobby part as business. There are some top draw bikes and pictures on the site including some shots from L’Eroica 2011, well worth a look here > www.dacorsa.de . Click here to discuss in the forum. 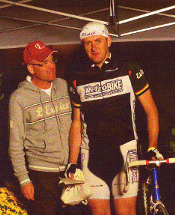 Seeing there is a lot of interest (and appreciation) on retrobike for Brodies the man himself kindly emailed over the story of how his own personal Brodie Rodie has evolved. Check the forum out for the full Brodie Rodie story. It’s a year on and due to popular demand (ok, two people but to me that’s the height of popularity), the Herefordshire Road Ride returns for 2011. So get your classic steel frames gleaming polished up, shave your legs and don your fluro Bolles for Edition II on Saturday 23rd July 2011. What does it involve, I hear you cry? A stunning, scenic and undulating Sportive style 80 km ride on very quiet country roads with the option of a country pub lunch/stop. There’s plenty of climbing but nothing super steep so with a compact and a bit of fitness all should be fine. As a flavour, here’s last years Aftermath thread. The ride will start and finish in Hampton Bishop, just outside of the cathedral city of Hereford. Full details in the forum here. The October 2010 Road Bike of The Month (r.B.o.T.M) contest was won by Lemond Fan’s 1991 Greg Lemond/Calfee Z Team Replica. Now taking nominations for the November 2010 rBoTM here. 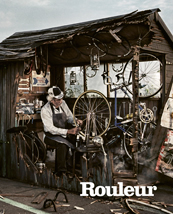 Rouleur is the finest cycling magazine around. Subscribe today and we’ll send you a free Rouleur cap worth £12.00. Rouleur features exquisite photography and incisive writing, using only the very best photographers and journalists in the business. Every issue goes behind the scenes at the world’s biggest road cycling races, recording the workings of this incredible travelling circus – a speeding cavalcade that circles Europe each year. Whether it is the Paris-Roubaix, Tour of Flanders, Tour de France, the Vuelta a España or the Giro d’Italia, Rouleur continues to provide unique insight into the Classics and Grand Tours, and into many of the other single day and great stage races that form the pinnacle of cycle sport. Click here for subscription offer or click here to discuss in the forum. The September 2010 Road Bike of The Month contest was won by Citoyen du monde’s Passoni – yet another win for the Passoni brand ! Now taking nominations for the October 2010 rBoTM here. I’d always fancied riding l’Eroica ever since I read about it a couple of years ago. Sunday was my chance. Here’s what happened. For those who can cope with the self-indulgence, here’s more. 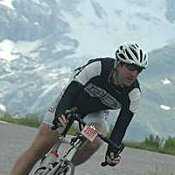 A while back I posted up about l’Eroica to see if anyone was interested. Quite a few were but without any definite commitment. Then Fraser said that he was keen and would sort out accommodation – it was on! After far too little training or preparation I found myself at Pisa Airport on Friday, ready to meet Fraser – apart from e-mails we’d only spoken on the phone briefly the night before and I’m not sure how he took my suggestion to approach me and ask “are you Blue Zeus?”. Thankfully that wasn’t necessary as my bikebag, Retrobike t-shirt and diffident air made that unnecessary. I was a little perturbed by Fraser’s classic grimpeur’s build but we chatted reassuringly easily on the shuttle bus. I quickly established that Fraser had two dogs but what was this “training with 1st Cats” – surely they’d fight with the dogs? La Marmotte is a one-day cyclosportive event in France, utilizing some of the climbs used in the Tour de France. The route is 174 km (108 mi) long and features more than 5180 metres of climbing. The event goes over the Col du Glandon, Col du Telegraphe, Col du Galibier and finishes at the top of one the most famous Tour de France climbs, Alpe d’Huez. Boom, Simple! Back at the end of 2009 my friend Alex sent me a link to La Marmotte, I was just back from doing 3 days in the Alps as part of a Macmillan Cancer Support challenge and thought it sounded like a good idea. I had trained hard for the trip with Macmillan and as a result had gone really well over all the major climbs that the Marmotte takes in, this was however over 3 days in September so a bit different to doing all of them in one day at the height of summer! When I first broached the idea of doing this with Mission control (aka Mrs Hilts) she stated that training for this was not to interfere with family life and by the way she was pregnant again with number 3 child due exactly 1 month before the Marmotte. Hmmm, not ideal really, I’m pretty sure Lance Armstrong doesn’t spend the month before the tour pacing up and down with a screaming baby at 2am! or lack of. I managed to convince myself that sweating in the garage on the Turbo trainer while watching re-runs of the 07 Tour de France on DVD would be a good way to get through the winter and I was right. I managed not to put on the obligatory 14lbs over Christmas and started the year in rude health and fit’ish… Over the course of spring I managed to fit in a few rides to work and back (which is a 47 mile trip each way) and one medium length sportive. So, when June arrived I was pretty much at my fighting weight of 13 stone (82 kilos) and feeling ok about the whole thing. I suppose the only nagging sense of doom came from the fact that I was looking for a time of around 9hrs for the Marmotte, and my longest training ride had been 4 hrs long…9hrs is a long time in the saddle and I had not ridden for that sort of time since the Etape du Tour in 2008 where I had bonked terribly after ‘forgetting’ to eat having been caught up in the excitement.. The July 2010 Road Bike of The Month contest was won by Slotcar55′s Masi Prestige – another win for Slotcar55 who looks likely to dominate this contest for a while. Now taking nominations for the August 2010 rBoTM here. A great ride was had by all on Saturday’s Herefordshire Road Ride AKA The Welsh Borders Grimpeur. The full aftermath can be found here. - Top selection of old steel (and it was only old steel) with The Guvnor on an early 90s EM Corsa Extra, Del on an early 80s Colnago Master, Dave on a mid 80s Colnago Master, the Alex’s on an 81 Bianchi and a 1990 Harry Quinn respectively and Ed on a relatively modern on a 1991 Zullo. - Bike of the day has to go to Alex’s stunning Bianchi with just the right amount of pantographed kit and to top it off he was riding tubs. Chapeau, mon ami. - “three socks for a pound”. You had to be there. Retrobike Road Ride – 24th July 2010 – tomorrow! Get your old road irons polished up, shave your legs and don your Bolles as we’re running a Retro Road Ride (AKA The Welsh Borders Grimpeur) on Saturday 24th July. A stunning, scenic and undulating Sportive style 90 km ride on very quiet country roads with a country pub lunch/stop. There’s plenty of climbing but nothing super steep so with a compact and a bit of fitness all should be fine. For more details and to register last minute interest click here and we’ll add a list of attendees. For those wanting a little more, this is the second in an increasingly egocentric set of ride reports (next up is my visit to the corner shop for a newspaper. And possibly a loaf of bread) so…..
Outside of the Grand Tours, the One Day Classics hold centre stage. And of those, the five ‘Monuments’ (Milan-San Remo, the Tour of Flanders, Paris-Roubaix, Liège-Bastogne-Liège and the Giro di Lombardia) are king. And separating out further are the cobbled classics – the Tour of Flanders (or Ronde van Vlaanderen if you want to go all Flemish) and Paris-Roubaix. And lets throw in Gent-Wevelgem for good measure. But the one that has always stood head and shoulders above the others, for reasons I’m not sure I can fully articulate, is Paris-Roubaix, ‘Queen of the Classics’, first raced in 1896. Why does it stand out? Images from the 70s, 80s and 90s and impossibly filthy riders covering incredibly rough ground in appalling weather? Perhaps. The fact that Belgium has almost twice as many winners as any other country? Probably. For whatever reason, the names Roger de Vlaeminck, Johan Museeuw and latterly Tom Boonen, the Beckham of Belgian cycling, have always been synonymous with Paris-Roubaix. Over a couple of pints in December, a friend suggested we ride the Fred Whitton (the event website describes it simply as “…. a 112 mile ultra hilly (mountainous!) 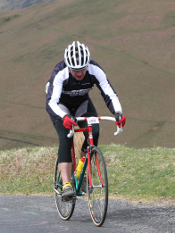 challenge ride over all the famous Lake District passes in a single day ride”.). Glowing with festive cheer I readily agreed, confident that with it’s popularity that we would never get in. We did. What follows is what happened, as best I can remember. After packing the car in the dark on Friday night, I had a restless sleep plagued with thoughts of not enough training and fear of what the event would bring (not helped by late rider information from the organisers that described poor road surfaces – potholes, corrugation from ice and snow, hairpins etc. – on 7 of the 9 major descents). Still, in the evening I’d eaten homemade shepherd’s pie, a pizza and four packets of crisps with houmous so both tapering and fuel preparation would see me through. Saturday dawned with strong winds and rain which continued as I drove North although by the time I arrived in Hawkshead the rain had ceased but the wind was still chill. I signed on and was concerened at the number of lean, sinewy men around – where were all the normal shaped people? Moving on to the overnight accommodation to wait for my mate to arrive, I chatted in the YHA carpark with another chap, a veteran of 4 previous Whitton’s, and as I wandered off, I heard him incredulously telling his companions “..he’s riding it on a 20 year old steel bike. With downtube shifters!”. It seemed that most of the hostel was taken over by Whitton riders and the storeroom was full of Cervelos, Parlees, the odd Specialized S-Works and Lynsky. I kept my style powder dry with my bike in the car. Sharing our dorm were two other chaps, one off here (Finbar) and his Polish mate (whose name I can’t spell, apologies). We ate together (soup, gourmet lamb burger, chocolate sponge for three of us but pasta and pine nuts for the Polish chap because “I am professional’. And with a time of 7 hours 20 the previous year, who were we to argue?). The April 2010 Road Bike of The Month contest was won by Shamus’ 1984 Colnago Arabesque, which will come as no to surprise to many! Now taking nominations for the May 2010 rBoTM here.